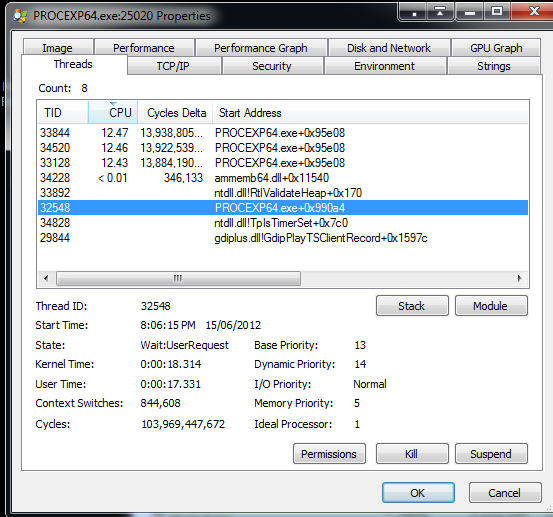 Process Explorer - High CPU - Itself! Discussion in 'other software & services' started by philby, Feb 6, 2012. Having just noticed that PE V14 runs at a constant 9 to 10% CPU, I downloaded V15.12 (most recent) and that is using around 40 to 50% CPU!! TM reports the normal 1 to 1.5% for whichever version of PE I run. Just you. Or not me anyway. Running at 2.5% here. philby, version 15.12 running at 2.87% here. Hmm...normal on my other machines too! Need to look into this, but how...? philby, right click procexp64.exe and choose Properties. Select the Threads tab to see a CPU % breakdown. Perhaps that will show you what's causing your high CPU %. Thank you - had already done, but didn't (and don't) know where to go from there...! While highlighting that thread, if you click on the Permissions button, what do you see? You might have several groups or user names. Also, clicking on the Module button, will reveal the Properties for that .exe. What do you see on the Compatibility tab? None of the check boxes are ticked. I've also tried killing the PE Current User/Software entries via regedit, thinking this might reset things, but no change! Yes, I also have an Account Unknown as well. Do you see anything out of the ordinary on the main window lower pane, when highlighting procexp64.exe? I'm running out of bullets, perhaps raising the question in the Sysinternals Forum might help! Found this older post: High CPU rate from ProcExp64. See second post. Have posted over at PE forum and sent zipped minidump to Mr R himself! Hope to get this resolved, if only out of interest.